For Climate Justice Month this year, UU Ministry for Earth is observing the importance of intergenerational equity as a component of the Unitarian Universalist Principles and a foundation for the manifestation of climate justice. Youth in the United States — and all over the world — are strong, prophetic leaders of the climate justice movement. Justice for #EachGeneration is a campaign started by the United Church of Christ (UCC) Council for Climate Justice to express solidarity within faith communities for the 21 youth plaintiffs of the historic Juliana vs United States lawsuit. 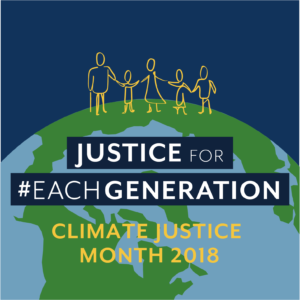 Many UU congregations are participating in this campaign for Earth Day Sunday this weekend, but there is still time and reason to have a Justice for #EachGeneration service later in the year: the trial date has just been set for October 29, 2018. Check out the UU Ministry for Earth resources to support Justice for #EachGeneration worship planning and let the UCC know about your service so that it counts towards their goal of 1,000 worship services (UUMFE will notify the UCC about all services registered on the Climate Justice Month/ Earth Day Sunday map). The Zero Hour movement was started by 16-year-old Jamie Margolin, who is suing her home state of Washington for the right to a liveable climate. Zero Hour is planning three days of youth-led climate action in Washington, D.C. this summer, July 19-21st. Read more about Zero Hour on their website. YouCAN (Youth Climate Action Now) is a program developed by Our Children’s Trust that trains and supports youth, their families, and other supporters to engage in civic participation with local government. YouCAN youth advocate for lasting legal protection for the atmosphere, oceans, and the Earth’s natural resources in the form of binding greenhouse gas emission reduction targets and climate recovery planning in line with the best available science. Youth participate directly in local government decision-making and petition City Councils for adoption of locally-tailored climate recovery laws, testify in public meetings of the City Council, and advocate at work sessions with local government leaders. There are numerous YouCAN chapters and Our Children’s Trust is supporting the formation of new chapters as well! Check it out. Earth Guardians — another party to the Juliana v U.S. lawsuit — also has a robust program to support youth climate leadership all over the world. See if there’s an Earth Guardians Crew in your local area that your local youth group could engage with — or perhaps they’d like to found one if there is not! UU Young Adults for Climate Justice is an activist community for Unitarian Universalists, ages 18-35, who are passionate about creating climate justice. UU Ministry for Earth supported the establishment of the UUYACJ in 2012, and has witnessed time and again ever since that supporting our UU young people strengthens Unitarian Universalism’s climate justice ministry immenseley overall. Please consider making a donation or taking a special connection to support the UUYACJ.